I am afraid I need to make a confession. I cheat at Battleship. Every. Single. Time. This misdeed goes back quite a long, long way, to when I was a youngster. A cheating youngster, I guess. In the super olden days before GreenTuna (BGT) Battleship was actually played with pencil and paper. I'm guessing it would have been more difficult to cheat back then, but it's hard to know without trying. I was part of the "Classic" Batlteship generation. There were two flip-top playing fields. 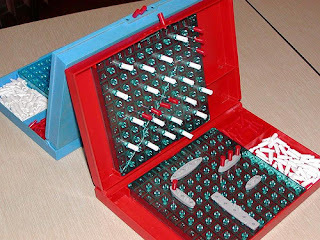 You placed your plastic ships (5 in total) in the grid on the bottom, and then you marked the guesses you made about your opponents ships on the flip top. A white peg for a miss and a red peg for a hit. The game is simple enough to pick up on the first round, and usually you just pray nobody finds your tiniest ship that only takes two hits to destroy. When all the hits have been made on a particular ship, the commercial showed some poor-guy loser hold his head and exclaim, "YOU SUNK MY BATTLESHIP!" The Battleship cheating occurred this way: My ships never dropped anchor. As I was busy keeping track of the guesses I made on my opponent's vessels upon the top part of board, I would also secretly keep track of guesses made against my ships on the bottom part of the board, right there alongside my ship. This way, when someone called a location and it happened to hit my ship, well, it DIDN'T happen to hit my ship, because my ship would miraculously sail away to some other part of the board where guesses had not been made. My cheating wasn't particularly foolproof, and it never guaranteed a victory, but, at the very least, it bought some time. Somehow it never made sense to me to play any other way. The board was big enough that if you were careful, you could move ships three or four times before it was "stuck." Nowadays, this classic game is electronic, so I have no idea if it is possible to twist the rules or not. What prompted this somewhat odd confession was my youngest nephew. No, he doesn't cheat at Battleship and he's too young to read this blog, so no worries there. But he thinks on his feet and and consequently he's able to adapt to the point where if you guess what he's doing, or building something might be, he's already making it something else. A truck becomes a robot becomes an "imagination vehicle" becomes a castle becomes a parking garage becomes anything else that flits through his mind. It's The Battleship loosey goosey rules all over again, but this time in the hands of a Kindergartner clutching a wad of Lego's. If this ailment happens to be hereditary, my nephew will be pleased to know that my cheating ways haven't permanently damaged my life. I don't cheat at cards, or trivial pursuit, or even at Monopoly, where I am always the banker. If I choose to keep the "float" in my "flotilla" what does it matter? And if my nephew builds a truck that morphs into a lawn mower that morphs into a dog, I, for one, will not be calling shenanigans. We creative types need to stick together.